Next to CA/ULO installations, Van Amerongen also supplies all accessories necessary for installation and maintenance. 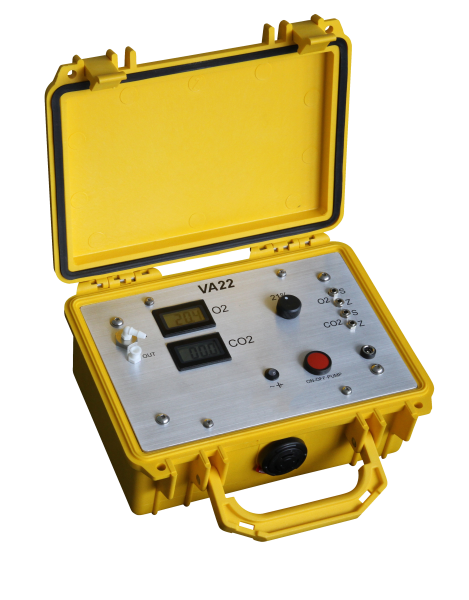 Van Amerongen provides in a range of gas analysing equipment, like O2- and CO2 meters. Combi meters are always built-in in our control systems. Of course, we can also provide in hand meters which can easily measure the O2 and CO2 values in your cold store, any time you like. Pressure fluctuations in your cold store as a result of cooling actions or weather conditions can cause leakages, leading to influx of O2. The placement of a flexible air buffer ('lung') compensates for pressure changes as a result of, for example, cooling or weather conditions. The buffer is made of durable and flexible, multi-layer PU film. Each storage room is equipped with its own buffer. Air buffers are dimensioned, based on the volume of a storage room and are available in volumes of 2 - 12 m3. Under extreme circumstances, an air buffer is insufficient to absorb pressure differences. In that case, an over/underpressure valve can absorb the pressure difference in your storage room to prevent damage. This safeguard is triggered at an over/underpressure of approximately 10mm WK. Each cold store used for CA/ULO storage needs at least one underpressure valve and one overpressure valve. Multiple valves are used for larger cells. Scrubbers are connected to the cold stores by means of PVC pipes. Depending on the type of machine, pipes with a diameter of 50 to 160mm, and corresponding cell valves, are used. Our cell valves are pneumatic and therefore very reliable and durable.